On December 4, 2017, the Thomas Fire struck Meher Mount, burning the stand of 16 eucalyptus trees by Baba’s Fireplace along with the large eucalyptus by the pathway to Baba's Tree. Eucalyptus trees can create a "high volumes of forest debris consisting of bark strips, limbs, and branches. The fuel complex formed by this debris is extremely flammable, and under severe weather conditions could produce drifting burning material with the potential to ignite numerous spot fires. Because stringy bark is carried away while burning, eucalyptus forests are considered the worst in the world for spreading spot fires." The Meher Mount Master Plan specifies, as is feasible, removing invasive plant species and replacing them with native, drought-tolerant vegetation, taking into consideration foliage that is also fire adapted for the region. The California Invasive Plant Council (CAL-IPC) classifies the blue gum eucalyptus as moderately invasive. It takes water and blocks nutrients to neighboring trees, including the Coast Live Oaks (Quercus agrifolia). One day when former Manager/Caretakers Samantha and Leslie Bridger (2010-2013) were working outside at different spots on the property at Meher Mount, they heard a thunderous crash. Each went running to see if the other person was hurt. Both Samantha and Leslie were fine. Fortunately, neither one of them was standing under the big eucalyptus tree near the area that marks the beginning of the pathway to Baba’s Tree. A very large limb of this eucalyptus had cracked and fallen to the ground. After the falling limb incident, the Meher Mount Board discussed removing the tree entirely. However, the proposition was too expensive, and there was some sentiment for keeping the tree as a landmark. Instead, Meher Mount hired professional tree trimmers to cut back major limbs as a safety precaution. After the Thomas Fire, arborist Michael Inaba, who is working with Meher Mount on the care of Baba’s Tree, noticed the threat of the large eucalyptus tree to nearby electrical lines and electrical transformer. He brought the issue to the attention of Southern California Edison (SCE), who tagged it for removal. SCE sent a professional crew on March 8 and 9, 2018, to take the tree down to the stump. At that point, the board voted to finish the job by removing the stump to keep the eucalyptus from growing back. In evaluating the options for the eucalyptus trees by Baba's Fireplace, the board took into consideration the pros and cons of removal. The cons for removal: This stand provided shade for group gatherings in the years before the Topa Topa Patio was built. They provided a wind break during occasional high wind storms. And they had stood witness to the presence of the Avatar of the Age during Meher Baba's 1956 visit. 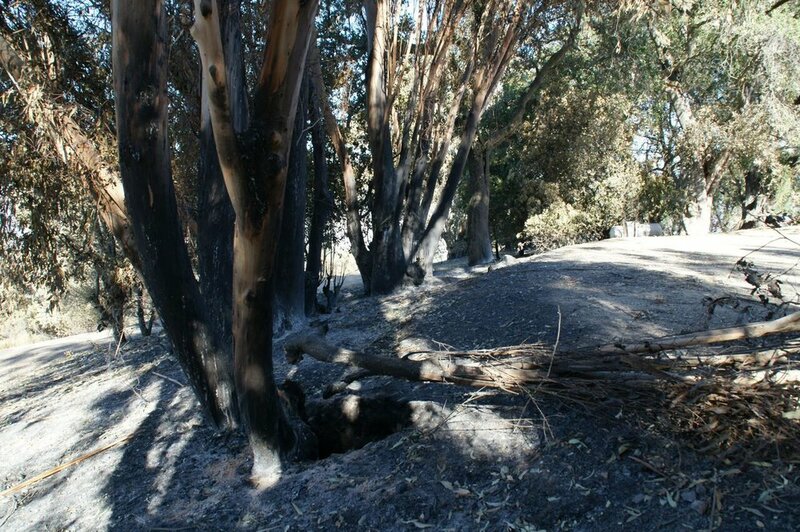 Ultimately, the board decided that having narrowly escaped major fire damage to Baba's Fireplace and the Visitor Center/Caretaker Quarters, it would exercise caution and remove the eucalyptus trees. It took the five crew members of LNS Tree Service five days to cut down the trees, grind out all the stumps, and haul away the wood. On Friday, March 30, 2018, the last of the 16 eucalyptus trees near Baba's Fireplace at Meher Mount were removed. The service of the eucalyptus trees to Meher Mount was completed. WHAT'S NEXT FOR THE AREA BY BABA'S FIREPLACE? Removing the eucalyptus stand by Baba's Fireplace draws attention to the spot where Meher Baba gave darshan (His blessing) to His followers in 1956. This fireplace is the only remaining man-made artifact of His visit - all other structures and machinery were destroyed in the 1985 New Life Fire. The fireplace was part of the room in the guesthouse where Meher Baba spent time with the group that joined Him on August 2, 1956. The Meher Mount Master Plan discusses plans to create a suitable area to commemorate His visit and to provide a spot for contemplation and reflection for visitors. With the removal of the eucalyptus tress, Baba's Fireplace and courtyard area have just moved to the top of the "to do" list. David Boyd, "IPCW Plant Report: Eucalyptus globulus," CAL-IPC (California Invasive Plant Council), accessed March 31, 2018. Liza Gross, "Eucalyptus: California Icon, Fire Hazard and Invasive Species," KQED Science, published online on June 12, 2013, accessed March 31, 2018. Kristina M. Wolf & Joseph DiTomaso, "Management of blue gum eucalyptus in California requires region-specific consideration," California Agriculture, Volume 70, Number 1, published online January 1, 2016. by University of California, Agriculture and Natural Resources, accessed online on March 31, 2018.